The Malta U-15 girls team secured their second straight win in the Development Tournament, currently being played in Thailand after beating Singapore 4-0 at the Chang Arena in Buriram on Tuesday. 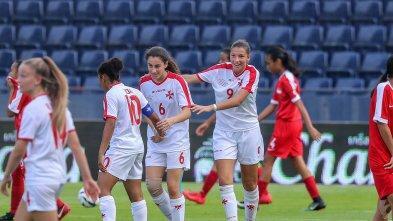 Led by coach Dorianne Theuma, the Maltese girls took the initiative from the outset. They made their pressure count on the 13 minutes when Kailey Willis headed home a corner to open her account in this tournament. Theuma’ girls continued to show the better ideas. They doubled their lead on 26 minutes with a fine long-range effort from Veronique Mifsud. Moments later, Mifsud tried her luck with a free-kick from outside the area but her shot was marginally wide. The Maltese remained the better side for the remainder of the half. They increased their advantage early in the second half when Willis scored her second goal of the game with a close-range finish. Theuma made a number of substitutions in the second half but the Maltese girls continued to control the game, adding another goal through Willis who thus completed her hat-trick. The Malta U-15 girls’ team wrap up their tournament commitments against hosts Thailand, this Thursday (1.30pm – Malta time). J. Caruana, L.C. Dimech (64 N. Blundell), A. Gatt (46 I. Camilleri), M. Fenech, R. Borg, M. Lucia (72 G. Mifsud), V. Mifsud (49 H. Khatib), M. Cortis, T. Borg, E. Sissons, K. Willis (67 R. Laferla).